In this last article dedicated to recording drums, I will give you three advice that ought to make your life easier when tracking drums. During a previous article I already warned you about how to handle the stress and fatigue of musicians during a recording session. This is particularly important in the case of the drummer, considering the amount of time it takes to set up all the gear to do the recordings. It is a good idea to call a friend who can come give you a hand as an assistant during the recording sessions. He or she doesn't really need to be an expert in terms of audio engineering, as long as your friend has a good pair of arms and legs, he/she will be perfect for the role. For instance, an assistant might come in very handy to place the mics, under your supervision of course. 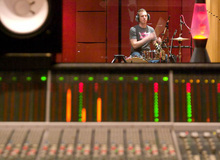 He/she can also tap the mics for a quick line check and then hit the drums themselves so you can set an initial level. Finally, an assistant will also be of precious help to move the mics in case there are any phase issues or to fine-tune the sound while you listen to the changes in the control room. All this will result in the drummer being spared a lot of time, energy and concentration, which will ultimately reflect on the quality of his performance. Trust me. The second advice I want to give you today has to do with the placement of the mics. Make sure your setup never makes the drummer uncomfortable! To avoid that, ask the drummer to play a track and observe him/her while at it. This will not only help you set the right preamp levels, but also to analyze how he/she plays the song in question. Pay special attention to the hi-hats and Snare Top mic, as well as the overheads, because they are likely the first to catch a hit when the energy increases... and I guess I don't need to tell you that whenever this happens you can forget about the take, so try to take all possible precautions to avoid it. To finish, I would also recommend you to be extra careful during any eventual pauses. Make certain that the drummer doesn't inadvertently move any of the mics. This is unfortunately very common and makes comping almost impossible during editing. It would be a pity not to be able to resort to this useful technique due to a slight bump on a mic stand during a pause for a smoke or whatever. And that's it for today. We've been discussing how to record drums for over six months now, but there are still lots of things left to say! Still, even if some of the techniques we've seen in this chapter can also be applied beyond the recording of drums, the time has come to move on. So, next week we'll return to the coziness of your home studio to discuss a topic that ought to interest a lot of you: recording on your own.